Ana is a home visitor for the First Steps Program, joining the family in October 2014 after participating in the program as a client. She was born in Chihuahua, Mexico and has been living in Taos NM since 2003. She is fluent in English and Spanish. Ana is currently pursuing her degree in Social Work as well as her Infant Mental Health Endorsement. She is certified as an Infant Touch and Massage Instructor as well as a Circle of Security and Love & Logic facilitator. 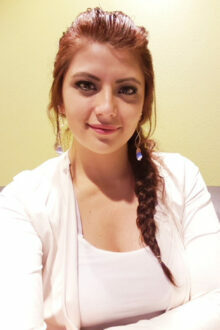 Ana loves furry animals, listening to lots of music and has a weakness for both sweet and spicy treats. She loves being a “goof-ball” with her children and traveling to new adventures. Her favorite seasons are early summer and fall.